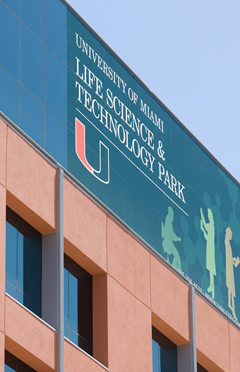 What is the University of Miami Life Science and Technology Park (UMLSTP)? 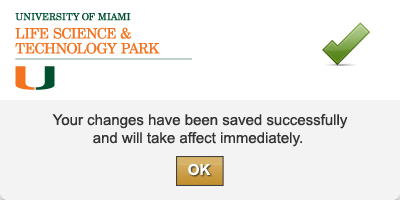 UMLSTP is an urban research park developed by Wexford Science and Technology in conjunction with the University of Miami (UM). The park forms the eastern boundary of the UM medical campus and is strategically located in the heart of Miami alongside Interstate 95 and in close proximity to downtown, the beaches and arts institutions. 2015-01-06 Ralph Pagano's Unnamed Restaurant While everything is still in the works (including a name), chef Ralph Pagano's new venue in University of Miami Life Science & Technology Park is slated to open this winter, and it will also serve as the Park’s food and beverage partner with full catering services. 2014-12-24 Chef Ralph Pagano will open a restaurant at the University of Miami. Pagano, who was a contestant on “Hell’s Kitchen” and “Iron Chef America,” signed a lease to open a restaurant at UM’s Life Science & Technology Park. 2014-12-17 New Restaurant by Celebrity Chef Ralph Pagano to Open at University of Miami Life Science & Technology Park. 2014-10-26 Norma Kenyon and her team are on a mission. “When I became vice provost of innovation in 2012, the University of Miami did not have a robust history of commercialization,” said Kenyon, who is also chief innovation officer at the UM Miller School of Medicine, a veteran faculty member and a longtime diabetes researcher. 2014-08-11 This year marks Roy’s Delivery Service’s 20th year anniversary in business. We have a lot to celebrate, and we also have exciting announcements to share. Roy’s Delivery Service is pleased to announce the opening of our new office in Downtown Miami, Florida. Our new downtown office will allow us to better serve clients by being in a more central location. “The opening of our downtown office is an important step in our firm’s continued growth”, said Hada Grullon, President. Our focus is this one thing; Roy’s Delivery Service will continue to get better in every direction and on every dimension. 2014-07-06 Hada Grullon is a bulldog — a tenacious, talented, self-made woman who turned an idea into a thriving business called Roy’s Delivery Service. Her company, which has been around for 20 years, delivers just about anything, but its core business is handling deliveries for the medical industry. Every day, Roy’s delivers human organs, blood, tissue, radiology film, sensitive documents and other specimens to doctors and medical facilities throughout South Florida. 2014-05-06 MIAMI (Reuters) - Silicon Valley need have no fear, but look out for the latest upstart to enter the tech arena: Miami. A south Florida millionaire investor is seeking to turn the city into a science and technology startup hub with a focus on the Americas, leveraging the region's better-known assets - beach condos, low taxes and capital flight from all over Latin America - to attract a new generation of Hispanic entrepreneurs. 2014-04-25 Friday night supper club at Thea's Pizzeria. 2014-04-24 Thea's Recipe Featured on WSVN 7 News. 2014-03-06 Thea's Pizzeria featured in Miami Curated web blog.